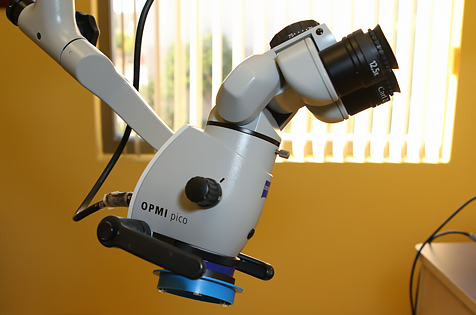 According to American Association Of Endodontics, dental microscope is useful tool for Endodontist in diagnosis and clinical procedure,such as identifying caries, insufficient crown or restorative filling margins , assessing craze or fracture lines. Also, During root canal therapy, magnification and illumination provided by the operating microscope aids with access cavity, removal of pulp chamber calcifications, treatment of calcified canal , locating of root canal orifices, identification of cracks and fracture lines ,and the treatment of internal/ external resorptions or perforation repairs . The identification of canal bifurcations and treatment of dental anomalies, such as dens invaginatus, or fused teeth. In endodontic retreatments, the microscope is helpful in identifying and removing left materials, such as sealer remnants, pastes or gutta percha , silver points and carrier-based materials, posts or fractured instruments. In surgical endodontics, microscope makes a huge difference in clinical procedure in the recent years . All steps of endodontic microsurgery are carried out under varying degrees of magnification include flap preparation, bone removal, identification of root apices, root-end resection, inflammatory tissue removal, root-end preparation, root-end filling then suturing. Local anesthesia is administered via injections to numb the tooth to be treated and the surrounding tissues. Dental dam in place, used to isolate infected tooth from the rest of mouth. An access hole is drilled through the biting surface of an affected back tooth or from behind a front tooth, allowing access to the pulp chamber and root canals for treatment. The diseased and dead pulp tissue is removed from the tooth with specially designed instruments. This is painless as the area is numb. The canals are disinfected with antiseptic and antibacterial solutions during the whole procedure. The canals are then shaped with very small flexible instruments to allow them to receive root canal fillings and sealers. 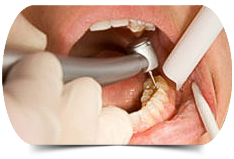 A very biocompatible rubber-like material called gutta-percha is used to fill the canal space in addition sealer. Several technique to deliver the gutta-percha and sealer into the root canal. A temporary or permanent filling material will then be placed to seal the access hole that was made to treat the canals. According to many studies it is recommended to place direct or indirect permanent restoration with cuspal coverage after root canal treatment to assure full protection of the root canal treated tooth and avoid any bacterial reinfection. Post root canal treatment symptoms are minimal, generally lasting from a couple of days to about two weeks. It is normal to have some minor discomfort after treatment such as slight soreness that can usually be managed with over-the-counter (aspirin, ibuprofen, paracetamol) medications or prescription drugs, or both. When we need root canal treatment? 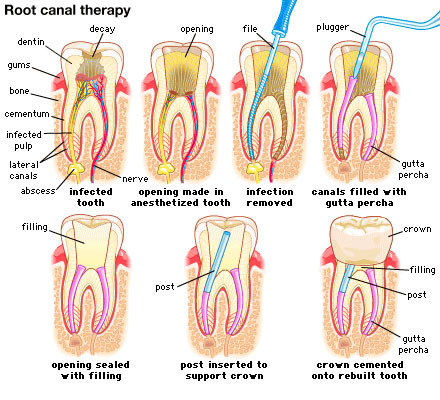 Root canal treatment is started when the pulp becomes inflamed or infected. The causes usually relate to deep tooth decay, repeated dental procedures, trauma to the tooth that cause crack, crown or/and root fracture. Unusual cause such as Gum disease may also lead to root canal treatment. Root canal treated teeth can last a lifetime, as long as you continue to care for your teeth and gums. If properly treated, the success rate of root canal treatment is over 95%. Endodontists are dental specialists with an additional two or more years of specialized training beyond dental school. because of that endodontists are efficient and precise on offering the diagnosis and treatment. Most endodontists offer tremendous flexibility on treating unscheduled emergency cases with immediate relief of dental pain. Many endodontists use state-of-the-art technology such as operating microscopes, digital imaging,CBCT, ultrasonic instrumentation, to treat their patients quickly and comfortably. Our Endodontist is highly trained to perform different complexity of endodontic treatment include root canal retreatment, surgical root canal treatment with latest technologies such as Microscope, digital radiograph, advanced instrument and devices to guarantee of providing high quality root canal treatment with international standards.